Get hired by making a resume that stands out! So many resumes look alike, and you need to be noticed! 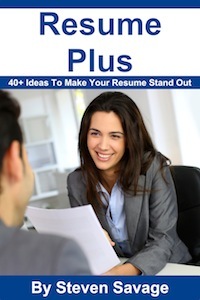 "Resume Plus" is your guide to making a resume that is more interesting - because being remembered means being hired. At the same time you wan't to make sure that "interesting" resume isn't confusing or annoying. That's not going to land you the job. The difference between Serious and Stunt Resumes. Nine basic ideas to make a resume more interesting. How to use simple formatting and graphics to tell people about you. Changing how you tell people about yourself to make a resume that's both interesting and clear. How to change and transform your resume in imaginative ways. The options and advantages of virtual resumes.
. . . and, of course, much more. It's your chance to stand out!